Daphne Greig: Three New Patterns! I have just put the finishing touches on 3 new patterns and they are available to order now. Welcome the new addition with a quilt that starts with a 36" panel. Complement the woodland theme with easy half square triangles in Cuddle Comfort flannel, because only the best will do for your little ones! 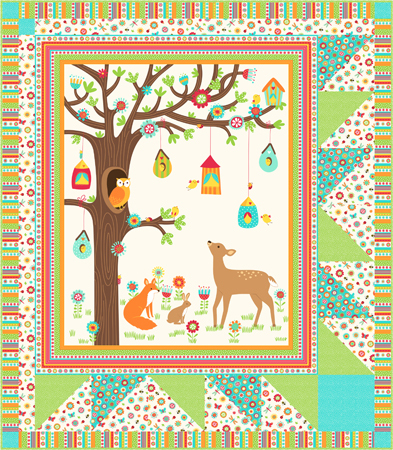 Quilt size: 48" x 55"
Fabric: A Little Birdie Told Me, Cuddle Comfort Flannel by Northcott, in stores July, 2016. 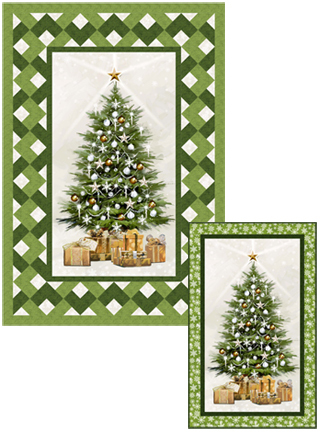 Make a holiday heirloom with this elegant panel illustrated in a classic painterly style by Richard Macneil. The addition of glitter adds a touch of glamour to this quilt. 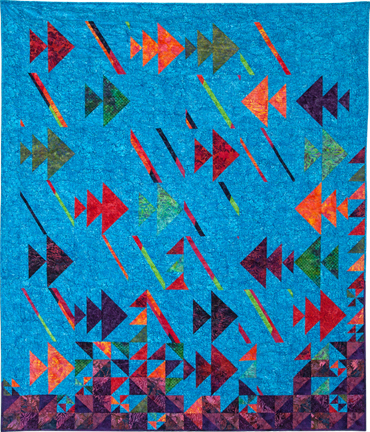 This quilt is an abstract undersea picture, with fish darting to and fro above a bed of coral. Using an Island Batik stack gives you the wide variety of fabrics to make this quilt. Quilt size: 60" x 72"
Fabric: Red Tide stack (40 - 10" squares) by Island Batik.